I’m actually an excellent driver all the time. And Rain Man, Dustin Hoffman and his infamous character role aside… I am even more of an excellent driver with my brand new Breast Cancer Awareness Scarf. Doesn’t it totally look like a driving scarf? If I had goggles to pose with, I would have strapped those babies on so fast! I LOVE this scarf, you guys! The fabric is really nice jersey and it’s a gorgeous color! They call it heather gray I think, but it sort of looks blueish green, don’t you think? 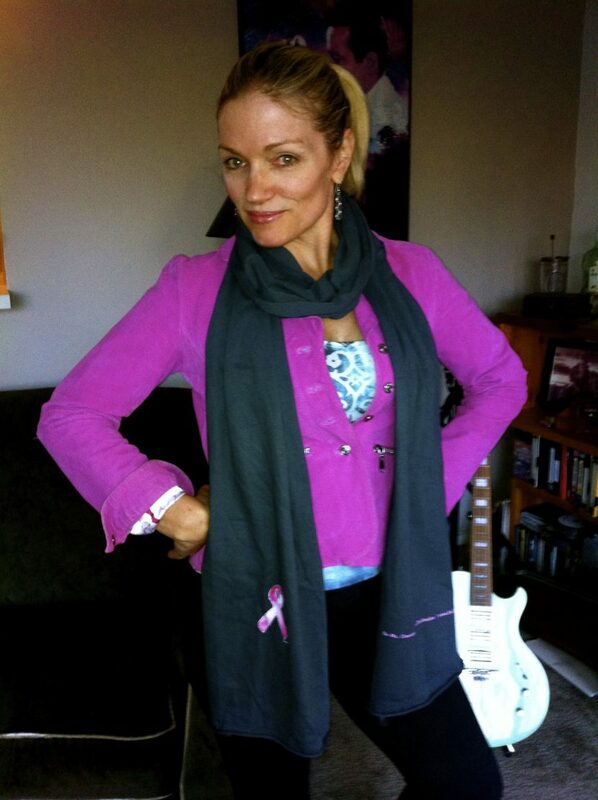 Anyway, I’m PSYCHED, and if you’d like to be psyched as well AND make an impact for Breast Cancer you can get your own scarf (in any one of nine different colors) for only $22.95 here. If the scarf isn’t your deal, then get the luggage tag. I talked about those already too, but I have pics in my boutique. You should check them out here. Register to receive these posts by email and get my eBook “Ahhhhh…Haaaaaa Moments with Ms. Cheevious” for FREE. Registration is on the right side bar of every blog post. See you next time.